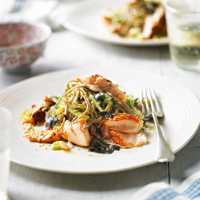 This easy recipe turns simple salmon fillets into a delicious Japanese-inspired main course. It also works well served in smaller portions as a starter. 1. Heat the grill to hot. Place the salmon fillets on a grill pan lined with foil. Pour over the soya sauce, sprinkle with togarashi and drizzle with honey. 2. Place under the grill to cook for 10 minutes or until dark and sticky and the salmon flakes easily. Remove from the grill, squeeze over the juice of 1 lime and set aside. Flake when cool enough to handle. 3. Meanwhile cook the noodles according to pack instructions, drain and refresh in a colander under cold water. 4. Place the orange juice and zest, remaining lime juice and zest, light soy sauce, sesame oil, garlic and ginger in a bowl and whisk until combined. 5. Dress the noodles with the orange dressing, add the salad onions and cucumber. Divide among 2 shallow bowls, top with the salmon and scatter with sesame seeds and the toasted nori.